Some are seasoned veterans after years of attending the Frozen Four. Others are in the middle of the momentum swing to college-hockey addiction. Still others are but neophytes, not only attending a first Frozen Four, but also their first college game. Compliments of Bauer, fans were invited to take a twirl around the Verizon Center ice a few hours before the first faceoff of the 2009 title game between BU and Miami. Three fans had the right score at 4-3 -- but with Miami prevailing. None would take the final score harder than Dan Bodden from Cincinnati, who played for the RedHawks in the mid-80s. "Rico's done a great job," said Bodden of RedHawks coach Rico Blasi. "It's their time to win on a lucky bounce." NHL.com congratulates two fans of the many interviewed -- polar opposites in their respective NCAA histories -- who nailed the outcome perfectly: Michele Eaton of Upper Marlboro, Md., and Christopher Chu from Norton, Mass. "I was never a big hockey fan until a couple of years ago," said Eaton, clinging to the boards as she made her first attempt to skate. "The Capitals got into the playoffs. I said, 'I need to understand what I'm looking at.' I didn't understand what they were doing. So I watched a few and had a friend explain to me what they were doing. 'What's the plan out there?' OK, so I finally got it. I went to a couple of home games and then the Frozen Four is on ESPN. And I said, 'What's that?' And here I am. BU, 4-3, in OT. I saw them play on TV, They're serious, they're fierce." How's that's for a puck analyst? Frozen Four always provides exciting game-winning goals and lasting memories for college players. Chu was also a prognosticator supreme. "It's just exciting, I come every year," said Chu about his annual Frozen Four experience. "BU wins, 4-3, in overtime," he said with total confidence. "They're just too good this year." Some other predictions weren't as good. Linda Kingsley is a Madison, Wisc., transplant to Arlington, Va. "It's just a different culture," said Kingsley about the game and its followers. "When you grew up on ice skates and grew up with hockey, this is just one of those things that's exciting for D.C. Boston, 3-2, no OT -- they just look so good." Scott Haynes and his 11-year-old son, Stewart, drove up from Raleigh, N.C. "He and I have been watching hockey of all sorts for quite some time," said Haynes about his puck bond. "We only have the Carolina Hurricanes. We wanted to see some college championship hockey. It's our first college hockey game and first Frozen Four. BU, 5-3; I liked what I saw the other night against Vermont." Eight-year-old Jack MacKinnon from nearby Arlington, Va. was buzzing about when NHL.com collared him for his guess. "My dad is on the (NCAA) host committee," he said. "BU, 5-3. They're a better team than Miami." Nick Lewis's Minnesota Gophers didn't make the tournament. Nonetheless, the Hopkins, Minn., native wasn't close in his predicted 5-1 BU win. He was right on the money, however, with his assessment of the 2009 Frozen Four. "College hockey fans come from all over the place," said Lewis excitedly. "It's awesome. Doesn't matter if your team makes it; the fans still come." 1. BU's Hobey Baker winner, Matt Gilroy, is the second Terrier to win the award; Chris Drury was the 1998 recipient of college hockey's player of the year. 2. Only five Hobey winners have played on the national championship team the year of winning the award; the last was Jordan Leopold for Minnesota in 2002. 3. A No. 1 seed has now won the national championship five times since 2000. 4. This was the first NCAA national championship in any sport to be won within the District of Columbia. 5. This was the 13th national championship to be decided in overtime since 1948. 6. This is the first team in any sport in Miami history to reach a final (or semifinal) contest. 7. 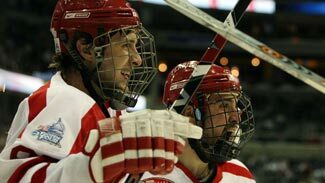 Boston University's class of 2009 posted a 100-43-21 record over the four years. 8. Miami's class of 2009 went to the NCAA tournament every year over their four years. 9. BU was 24-0-3 this season when Nick Bonino scored at least one point. Bonino scored the tying goal at 19:43 of the third period. 10. This was Boston University's 10th appearance in the title game. BU has won it all five times, which ties the Terriers for fourth in NCAA history. Michigan leads with nine. That they did, and NHL.com thanks all the fans who participated in the 2009 Frozen Four Fan Poll. On Campus Clips -- The 2009 Hockey Humanitarian Award was given to Northeastern senior Missy Elumba. Given annually to college hockey's player that most personifies true community spirit through the selfless commitment of leadership, effort and time, Elumba dedicated four years to putting others ahead of herself. Among her involvements, she taught pre-schoolers, engaged in community fundraising, and traveled abroad to help the less fortunate in places like Mexico and India. ... The 2009 Lowe's Senior Class Award for the consummate student-athlete that includes the criteria of excellence in the classroom, character, community and competition on the ice was given to Michigan State goaltender Jeff Lerg, who led his Spartans to the national title against Boston College in 2007. ... The Hockey Commissioners Association (HCA) named BU goaltender Kieran Millan the National College Hockey Rookie of the Year, and senior Air Force captain Mike Phillipich the Derek Hines Unsung Hero Award. Hines played four years at Army before was killed in the line of duty in Afghanistan in 2006. ... The 2009 Frozen Four All-Tournament Team includes Miami forward Tommy Wingels and defenseman Kevin Roeder, and BU forward Nick Bonino and Colin Wilson, defenseman Colby Cohen, and goaltender Kieran Millan. Cohen was named the Most Outstanding Player.